Synopsis: The Rover, David Michod’s highly anticipated follow-up to Animal Kingdom, is set in a world 10 years following the collapse of society. The rule of the law has disintegrated and life is cheap. The film follows hardened loner Eric (Guy Pearce) as he travels the desolate towns and roads of the outback. When a gang of thieves steals his car they leave behind a wounded Rey (Robert Pattinson) in their wake. Forcing Rey to help track the gang, Eric will go to any lengths to take back the one thing that still matters to him. The road movie has been a Hollywood fixture for as long as there have been movies, and the desire to reclaim stolen property has been at the center of films as diverse as No Country for Old Men and Pee-wee’s Big Adventure. The two tropes collide in the post-apocalyptic thriller The Rover. Set ten years after “the collapse” in the Australian countryside, The Rover stars Guy Pearce (Prometheus) as a loner named Eric who, while stopping for a drink at a makeshift watering hole, has his car stolen by a group of outlaws. Wanting it back, he takes the thieves’ old truck and sets off in pursuit. Along the way, he comes across a mentally challenged young man named Rey (Robert Pattinson from the Twilight movies, Remember Me), who asks why Eric is driving his brother’s truck. Eric takes Rey captive, forcing the halfwit to lead him to the brother. Eric and Rey make their way through the dangerous outback, forging a strange type of trusting friendship along the way to finding Eric’s car. The Rover is directed by David Michod (Animal Kingdom) from a screenplay that he wrote himself, along with Joel Edgerton (better known as an actor for his roles in Warrior and The Thing). The story, if you can call it that, is simple; Eric wants his car. The plot moves slowly and deliberately, and the film concentrates heavily on the characters. Eric is an honorable guy, only taking what he needs, even when much more is available to him – he just wants what was taken from him, nothing more, nothing less. Rey has the fun arc; he seems like a simpleton, but there often looks to be much more going on behind his eyes, and he changes from friend to foe several times over the course of the narrative, sometimes over the course of a single scene. The two of them together make for an odd little anti-buddy film, and it’s one that is hard to not watch. There are lulls in the story and holes in the plot, but the relationship between the two men patches everything up – the audience is still with them, even if they’re lost themselves. Its takes a bit of patience to get through, but The Rover delivers some great acting in a story that hasn’t been told to death. As far as post-apocalyptic worlds go, the one that Michod puts forward in The Rover is very believable. It doesn’t have the exploitation factor of the Mad Max movies, and isn’t as glossy as, say, The Hunger Games. The unnamed event that caused the collapse of society was not so catastrophic that it destroyed everything in its path, but did seem to take down the economic and social aspects of the world. The survivors carry weapons, but they’re regular guns and knives, nothing space-aged. The same can be said about the vehicles; they’re not futuristic by any stretch, just regular cars and trucks. The people are real as well, distrustful of one another, but also knowing that they need each other. The reality of the situation is illustrated perfectly in one scene where Eric and Rey have found a woman who is a doctor and can treat their wounds. She is initially skeptical about their reasons for being there, then warms up to them when she realizes that they need her medical services. Soon, when another group of people show up and violence erupts, the doctor collapses to the floor, screaming. She’s terrified and mortified, because all she wanted to do was help people, yet now they are getting hurt and dying in her front yard. That’s the kind of dystopia that exists within The Rover; the kind where no one knows who they can trust, but they are often forced to take a guess. Audiences know what to expect from Guy Pearce, but the real surprise in The Rover is Robert Pattinson. Like Daniel Radcliffe in The Woman in Black and Elijah Wood in Maniac, Pattinson seems to have chosen the role of Rey as a way to distance himself from Edward Cullen and his Twilight past, and he has made a great decision. Pattinson really sinks his teeth into the role (no pun intended), playing the dirty dummy very convincingly. There are a handful of supporting roles, but the movie is basically Pearce and Pattinson, and they own it. Much of the film is a mental chess match between the two main characters, both struggling to figure out if they can put any faith in each other. Pearce and Pattinson constantly exude a very fragile type of chemistry, comforting and calm one minute, then explosive and volatile the next. Their performances more than make up for the lackluster script; when nothing’s happening in the story, there’s still plenty happening onscreen. 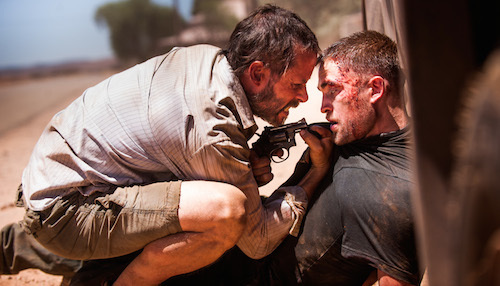 The Rover is an extremely character driven film, and the actors bring the characters to life. The score to The Rover is more than just music, and every noise and hum of the soundtrack reeks of a post-apocalyptic dystopia. The score is credited to Antony Partos (Disgrace, Animal Kingdom), but it is much more of a collaboration than a single work. Partos may have handled the heavy musical lifting, but the soundtrack is aided by some analog tape looping by William Basinski (The Comedy) and some additional composition by Thom Kellar (Son of a Gun). The music is also mixed in with the sound design of Sam Petty (a frequent collaborator with Partos, having also worked on Disgrace and Animal Kingdom), so the resulting mashup is very much of a musical collage, full of droning tones and buzzsaw effects that are accented by the occasional helicopter sound effect. Funny as it sounds, it does all come together as music, but not in a traditional film score way. While not quite as subversive as David Lynch’s Eraserhead soundscape, The Rover‘s score gives the viewer an unsettling feeling that basically lasts throughout the movie, and it’s extremely effective within the context of the film.